An American classic, these almond butter cups are awesome for a little treat or as a home-made present. This recipe is based on one from Carefree Candies but uses almond butter and a few tweaks. Add coconut oil and cocoa into a pyrex glass bowl and warm slowly. Once a paste has formed add the stevia extract, maple syrup, salt and vanilla. Stir until combined well – the mixture will be fairly thick. While the chocolate mix is melting, prepare the filling. In a medium bowl, combine almond flour, almond butter, stevia and salt. Mix using a spatula or your hands. Adjust sweetness and salt to taste. Using a melon baller, large spoon or piper, scoop heaping tablespoons of the chocolate into mini muffin case. Use your thumb to make a well in the center. Using a teaspoon, scoop almond butter mixture and form 1⁄2 inch balls. Push the almond butter balls onto the chocolate, flattening with your fingers. Coat with the chocolate mix if you like although you may need a little more than above ingredients to cover them all. Transfer to refrigerator and chill for 30 minutes. Remove from fridge. Using a thin knife, run the blade around the edge of a cup and pop it out. Or use silicon cases. 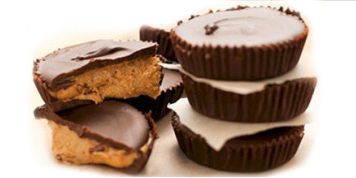 Store almond butter cups in an airtight container in freezer or refrigerator. Cocoa (organic or raw) is high in antioxidants and Magnesium. It has anti-anxiety properties as well as enhancing memory through epicatechin, promoting heart health through its flavanoids and even detoxifying through its sulphur content. Coconut oil is high in medium chain fatty acids (MCFA) that burn fat and rejuvenate skin and hair. Nuts like almonds are high in healthy fats that promote abdominal fat loss and contain CCK – the ‘feeling full’ hormone. Oh my gosh! This seems amazing! Thanks for posting this! I sent a link to this page to my lovely wife (and hope she takes the hint).